Supplier of PE Foam Products and Quality Cases for More Than 30 Years! 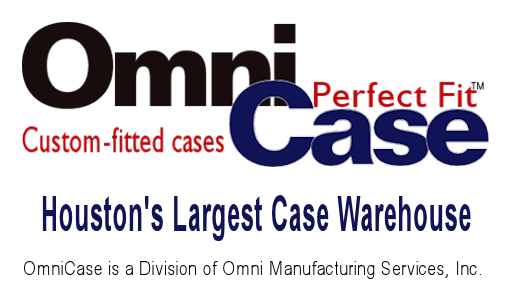 OmniCase has been supplying cases and custom foam inserts to industry and professionals for more than 3 decades. 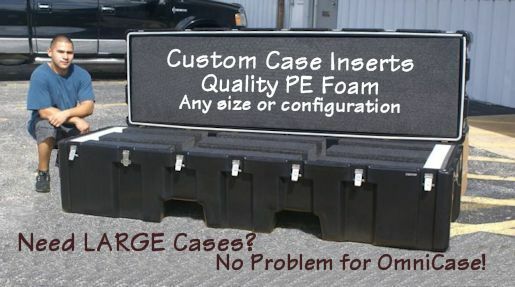 We are known for our developments and advances in interchangeable, fitted polyethylene foam case insert technologies. Organizations such as the military, law enforcement agencies, oil and gas exploration instrumentation groups, shipping specialists, sportsmen and others, look to us for shipping and packaging solutions for protecting costly and delicate payloads. Isn't Omni the kind of company with which you want to do business? Our lines of communication are open to keep it as simple and convenient as possible for you to reach us by voice, e-mail, text and fax. Call with questions or send us your specifications and requirements for quote requests. 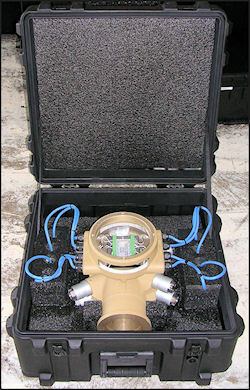 Omni Case is ready to help you solve your unique issues with packaging "problem" products, shipping delicate instruments, and tough or hazardous materials transportation scenarios. Our customers come to us with problems and get real solutions! The polyethylene foam used for our case insert bottoms is ridged. It is characteristically moisture, bacteria, chemical, grease, mold, oil and solvent-resistant. PE foam is closed cell, so it is buoyant and does not sponge or absorb liquid. The bottom liners are made from layers of 1.7# or 2.2# density polyethylene. 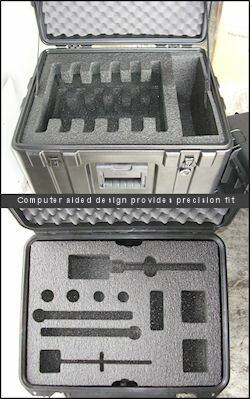 CNC/CAM technology cuts the precision compartments into the foam to nest the parts. The solid black PE foam resists scuffs, abrasions, and stains. 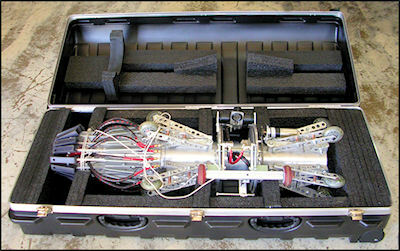 Convoluted polyurethane used in the case lids is softer. Its spongy texture allows it to conform to almost any shape. PU convoluted foam is commonly used for cushioning unevenly shaped case contents to prevent shifting or rattling in transport. PE foam is a long lasting material. 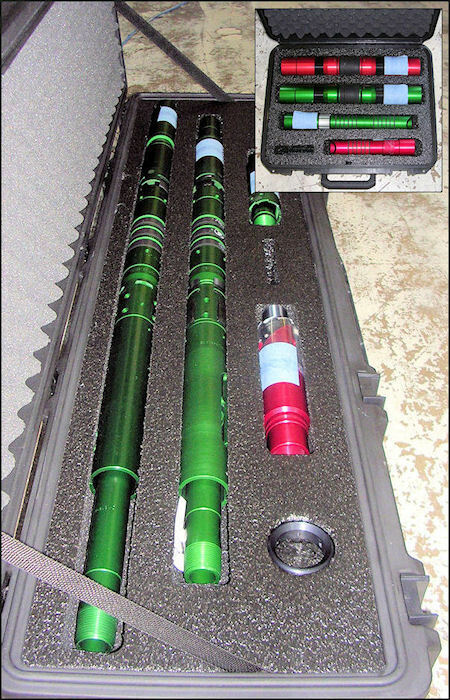 With reasonable care you will get excellent longevity from your foam inserts. The photographs in the gallery below, as well as photos on other pages on this website are examples of custom foam inserts tailored to protect various objects. Most of Omni's case inserts are one-of-a-kind. 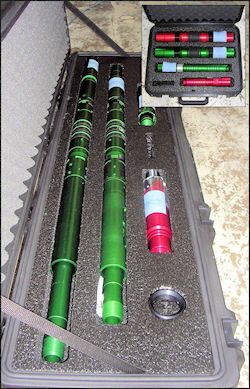 The case shells shown are products from the well-known case manufacturers for which Omni distributes. Computer aided design and CNC manufacturing processes developed by Omni provide the precision fit and uniform tolerances. Click on any photo to view a larger detailed image.